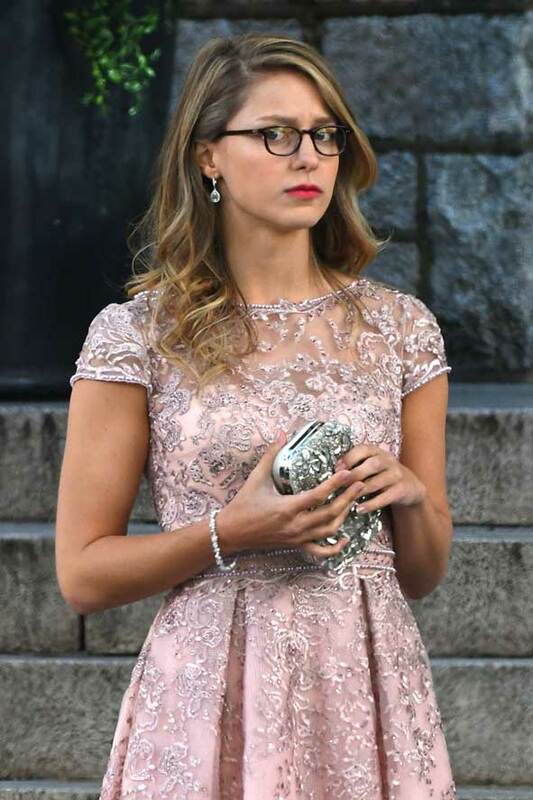 Spoiler Alert…Supergirl was spotted swapping her iconic superhero costume for a pretty pink dress as she attended THE Wedding of Barry Allen AKA The Flash and Iris West! 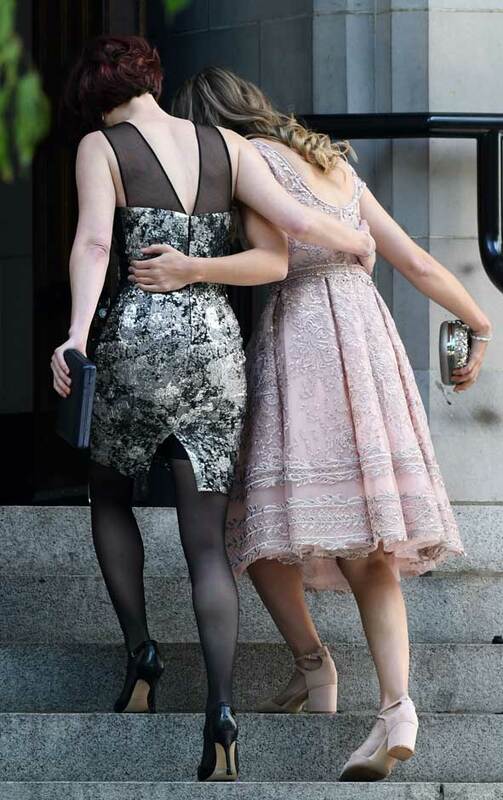 Melissa Benoist AKA Supergirl AKA Kara Zor-El was joined by Alex Danvers, played by Chyler Leigh, outside the steps of St. Paul’s Lutheran Church. 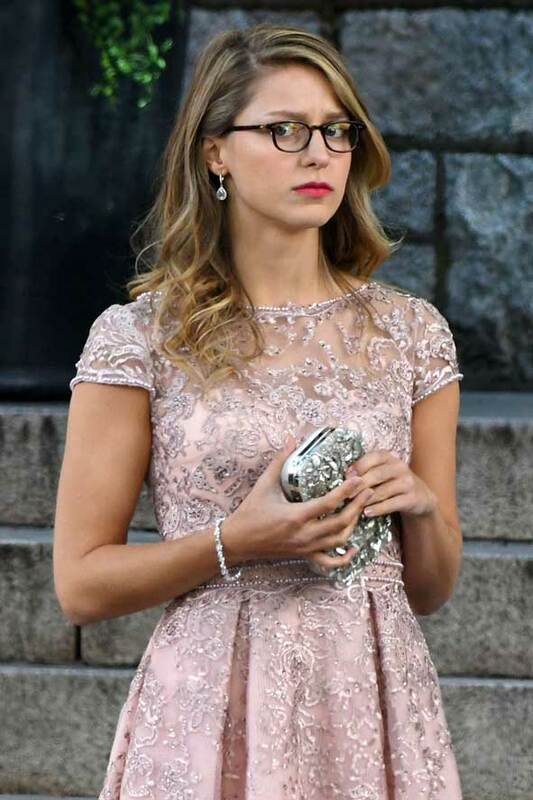 Supergirl / Kara Zor-El matched her glittering silver crystal with red lipstick, black framed sunglasses, and a matching pink sparkly clutch handbag. Chyler Leigh and Supergirl were filming scenes for a Supergirl / The Flash cross-over where Barry Allen is set to get married to Iris West. 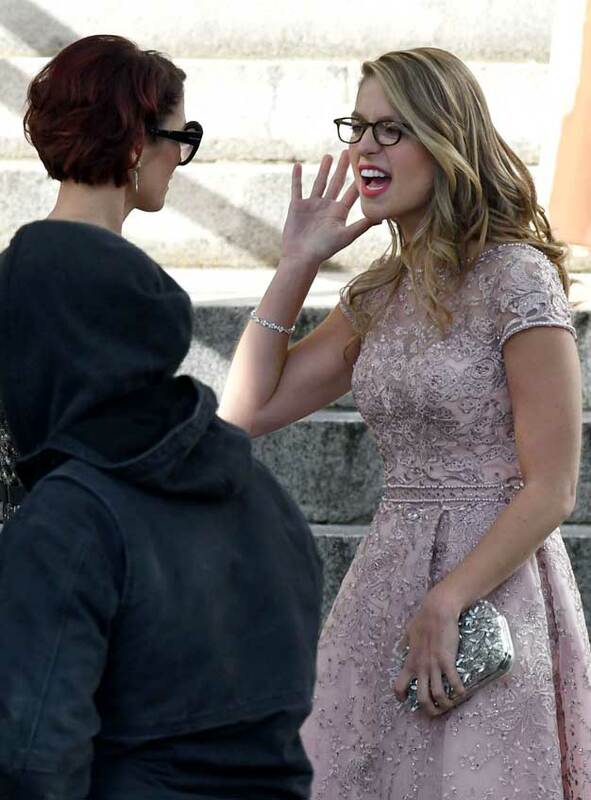 Chyler Leigh fashioned a see-through elegant dress as she looked to be arguing with Supergirl outside the clutch. 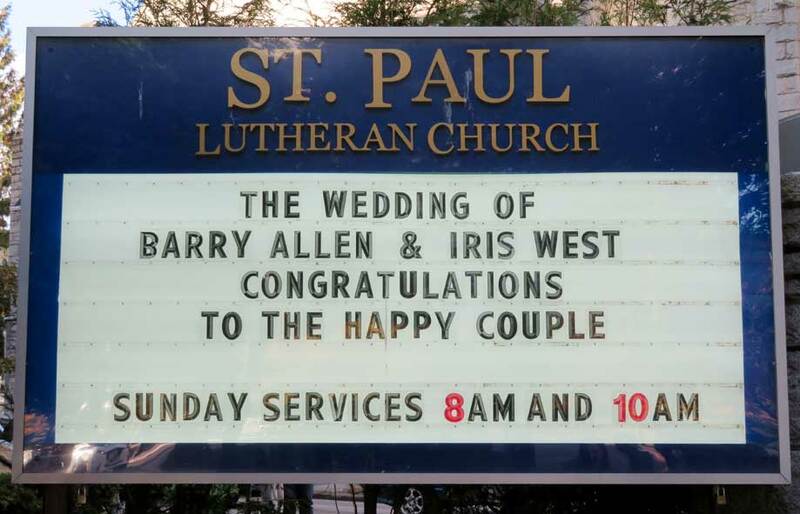 The sign even stated outside the church: “The Wedding of Barry Allen & Irish West Congratulations to The Happy Couple”. 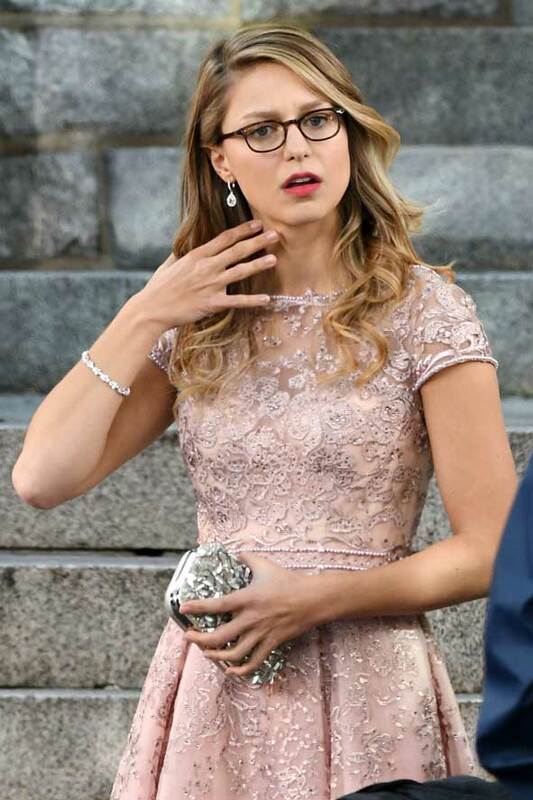 Supergirl was also spotted fighting SUPERMAN in the Season finale! The ‘Man of Steel’ was back in National City with Superman appearing to wade through water and then kicking Supergirl! The wedding of The Flash is set to be interrupted before they moving locations. Pictures of Iris West in her white wedding dress looking distressed suggesting the wedding might not have happened at all! 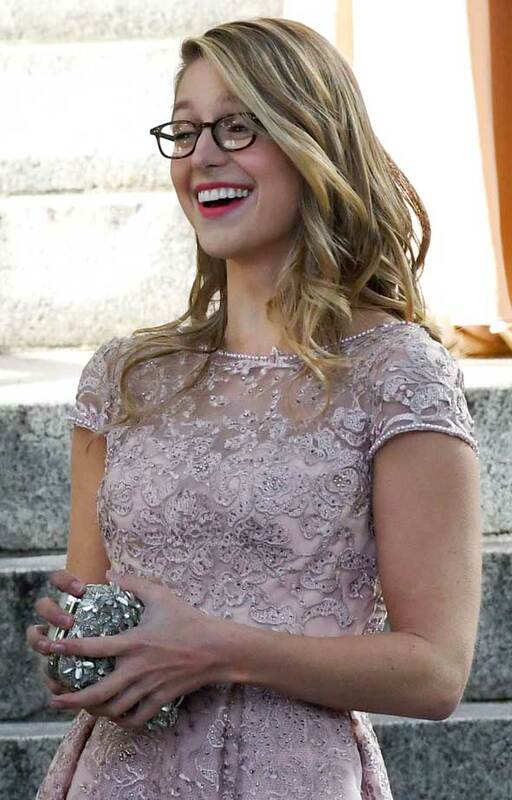 Supergirl Trivia: Supergirl is the biological cousin of the superhero Superman!